"I never see a real Fox-Terrier nowadays", said the Rev John Russell in 1875. If the great man were alive today, he might change those words to read: "The only real Fox Terrier I see nowadays is called a Plummer Terrier"! "That the fox-terrier of today is a great improvement, in so far as looks go, on his predecessors of forty or fifty years ago is beyond question, though whether he is better suited physically or morally for work underground is a matter of opinion", wrote the knowledgeable Pierce O'Conor in his Sporting Terriers of 1926. If O'Conor were alive today, could he say the same about the latest batch of Plummer Terriers? I believe that it is fair to state that of all the types of dog spoiled by the effects of the Kennel Club-approved show rings the Terrier Group has suffered the most. This is sad for a number of reasons: firstly, the KC was founded by sportsmen, with the Rev John Russell an early member and Fox Terrier judge; secondly, the breeders of those terrier breeds registered with the KC boast of the sporting ancestry of their dogs - and then dishonour it, and, thirdly, some quite admirable breeds of terrier have been degraded, truly insulted, in this way. Discounting the Airedale, never an earth-dog more a hunting griffon, and multi-purpose dogs like the Kerry Blue and Wheaten Terriers, that were all-round farm dogs rather than specialist terriers, all show terriers should only be called full champions if they have passed an underground test. Working terriers have to be kept honest! Plummers are tradesmen! In the United States, they conduct such tests, ranging from 'Introduction to Quarry' and 'Junior Earthdog' to 'Senior Earthdog' and 'Master Earthdog'. To date I know of no master earthdog tests being held but just under ten dogs hold the senior earthdog title. In the introduction test, the terrier (or working Dachshund) has two minutes to enter a ten foot tunnel, negotiate a 90 degree turn and 'work' the quarry for 30 seconds. The American enthusiasts say that "you put a dog down the hole but you get a terrier out of it". In the master earthdog test, acting in a brace, a dog has to follow a 100 foot scent trail to a hole, which is intentionally a false one, investigate the false den without giving tongue, then navigate 30 feet of tunnel, three 90 degree turns, a false exit, a constriction point and an obstacle. The French have similar tests. Seventy years ago, O'Conor was advocating something similar. He described the French apparatus for trying terriers: a wooden conduit 7½" wide, sunk in the earth, with passing chambers, just over 50 feet long. Terrier-testing underground is so much more a basis for judging than any 'beauty show'. It tests, however artificially, the working instinct and character of the dog. But even beauty shows should end up rewarding a working physique rather than one cosmetically appealing. Is the Plummer Terrier getting too flashy? Does it need to be kept honest by a field test? But what should 'working appeal' be based on? The original working Fox Terriers were barrel-chested and featured a fairly straight stifle and hock; the longer tibia and well-bent hock of the show ring terrier of today is not much use underground. But an even bigger difference lies in the shoulder angulation and depth of chest. Show Fox Terriers feature without exception upright shoulders and slab-sided but deep chests; neither of these physical attributes help an earthdog. Nor does the short back of the pedigree Fox Terrier, which reduces flexibility and overall suppleness. It does however produce a more compact-looking showy type of dog. Will the Plummer become just another fashion-item show dog? Does a Plummer need qualifications? The craze for long heads in show terriers, exemplified most clearly in the Kerry Blue and the Smooth Fox Terrier, is rooted in the misguided belief that length gives power. You also hear the expression: "plenty of heart room", which is strange when the heart doesn't actually change size when the dog is exerting itself. Plenty of lung room is desirable, especially in terriers which run with the hounds. But it is rib-space which gives a dog lung room, not depth of chest. I have heard terrier show judges fault a very muscular terrier, used to hard exercise, for being 'loaded at the shoulders' when the fortunate dog had developed muscle which projected on the outside of its shoulders. Any individual accepting a judging appointment should question their own capability and 'eye for a dog' before proceeding. Symmetry is important in most working animals; in a Fox Terrier measuring two feet from the top of its head to the ground, its front should cover not more than eight inches in width, a proportion of at least 1 to 3. In his informative book The Popular Fox Terrier of 1950, Rosslyn Bruce, who drew on the knowledge of the Rev AJ Skinner, a breeder of working and show terriers, makes great play of correct proportions. His best all-purpose terrier came out showing the measurements indicated balance. He believed that height at the withers should equal the length of the dog; he also argued that the depth of chest should equal leg length. He sensibly argued against 'square' Fox Terriers, stating this encouraged upright shoulders, too short a back and faulty necks. Cobbiness is not a merit in an earth-dog; flexibility comes first. Bruce favoured a good reach of neck, flexibility of body and correct shoulder placement. Plummers need sound shoulders! As dog-show exhibitors without working experience gained the ascendancy, these arguments were forgotten. 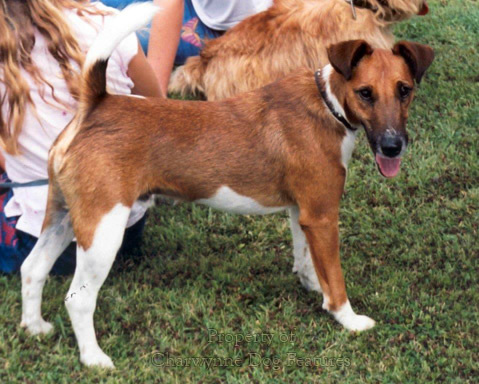 In time, a top show judge like MacDonald Daly, despite owning coursing greyhounds, was advocating Fox Terriers with a long muzzle, short back and upright shoulders - now standard and accepted as the norm, actually held as the perfect earth-dog blueprint, the ideal anatomy for a sporting terrier! As KC dog show judges extend their reach, Plummer Terrier fanciers need to keep their heads. Working terrier enthusiasts will never show great interest in precise measurements, exact proportions or wordy descriptions of anatomical features. But balance, symmetry, correct proportions and physical soundness really do affect function and therefore performance in a hunting animal. Terrier show judges may prefer to judge entirely by eye and experience, but is this enough? A seminar of working terrier judges to bring on the younger judges would surely be of value. It would be interesting to hear what Plummer Terrier show judges' decisions are being based on. Their own stock? The flashiest exhibit? The most influential exhibitor! Pedigree livestock is still judged to a scale of points; pedigree dogs no longer are. Subjective judgements can bring fine differences of opinion to the fore. But for a working terrier to win a prize with upright shoulders, splay feet, a wry mouth and no lung room, as I witnessed a couple of years ago, is more than depressing. If countrymen can't judge a dog these days, what hope for urban-based judges at Kennel Club shows? A functional physique is often so different from the flavour-of-the-month anatomy. KC show judges all too often follow fashion and that can be disastrous! The list of terrier breeds as recognised by the Kennel Club could have looked so very different had fate played another role. In place of famous breed names like the Sealyham, Scottish, Welsh, Irish, Border, Norfolk and Parson Russell Terrier, we could so easily have ended up with the Trumpington, Cowley, Bewcastle, Elterwater, Suffolk, Otter, Will Norris and Squire Poole terriers. In the early nineteenth century, many localities, even some valleys, had their own favoured type of terrier, some of which became swept up in a distinct form we now call a breed. Without retaining their true identity, their individuality, the Plummer Terrier could in time sink without trace. Not much has been written about the terrier types that did not achieve KC breed status, mainly because terrier work was not a job for the educated, monied classes who could have written books about them. As a consequence, it is probably easier to research just one setter breed than all of our lost terrier breeds, such is the disparity of written material. But now, just in time, as the new millennium unfolds, the working terrier breeders, who never follow fad or fashion, are active again. Just as a working Clumber Spaniel, half the weight of the show dog and with sounder hips and eyes, is being promoted, so too are recast working Sealyhams and Bedlingtons, a resurrected Lucas Terrier and our fairly recently-created breed, the Plummer Terrier. I often discussed the type desired in the Plummer Terrier with its creator the late and lamented schoolmaster-turned writer, Brian Plummer, author of a couple of dozen books, mainly on lurchers and terriers, and recall his words - and indeed his changes of mind! My last discussion with him concerned a renewal of Bull Terrier blood in his breed that he once advocated and that he later renounced. His desired type consisted of: between 11½ and 13½ inches at the shoulder, smooth coated, with a head displaying signs of both Bull Terrier and Fox Terrier ancestry and a striking fiery tan colour with white finching. These dogs were developed in a hard school and now breed consistently true to a type. There are two breed clubs, the older one, the Association, having a stud book going back to the early 1950s. There was an approach (or enquiry) to the KC for recognition; this would bring immortality to the breed's founder but not necessarily ensure its perpetuation, if the English White Terrier is anything to go by. Enthusiasm has to be sustained to be rewarded. Both the Plummer Terrier and the Sporting Lucas Terrier enthusiasts observe written and approved breed standards, although each of the two breed clubs in each breed work to different standards, something to be rationalised in the long term. Many of the Plummers have been sired by working terriers owned by terrier-men working for Foxhound packs. I am told they have exceptional noses and it would be difficult to find better ratters. At least one is being used to track deer, rather as the Germans use their 'teckels'. They can display what French huntsmen would term 'excessivement meurtrier' or be, more euphemistically, determined vermin-killers. They are certainly not dogs for town-dwelling owners where there are cats, and hamsters, abounding! A zestful carriage, a blur of fast-moving legs and a show of bossy determination from a terrier in the show ring often bring admiring words - unfailingly from the fawning, uncritical TV commentators at Crufts. Most small pedigree breeds that I see in the show ring display poor movement, usually stepping short in front with little forward reach and lacking any power from their lower hind quarters. In Fox Terriers front movement is appalling. Once judges regard and then accept such limited movement as characteristic then an inbred fault is on the way to becoming sealed in the gene-pool. Those supporting KC recognition for their breed need to read the show critiques on the registered terrier breeds, so often damning, especially on movement. I can understand, without supporting, poor movement in Toy breeds being condoned, so many have anatomical designs that create such an undesirable manifestation, but unsound movement in small terriers is worrying. These are sporting breeds. The sporting terrier is part of Britain's great sporting heritage and even the smallest of them must be a real terrier, in build and in attitude. Exhibits from any sporting breed should be disqualified in the ring for poor movement. They could not work! But what are show judges saying about movement in the terrier breeds in their critiques? Here are some: Border Terriers - "Movement is still a problem..."; Border Terriers (at Crufts) - "Sadly, movement left much to be desired..."; Dandie Dinmont Terriers - "Hind movement in some was very bad..."; and from Crufts 2000 - Airedale Terriers: "Movement is shocking..."; - Kerry Blue Terriers: "Two main faults appeared...and rear movement"; - Sealyham Terriers: "I found...bad hind movement." The four Crufts reports are the most worrying, for how do exhibits that display poor movement actually qualify? Who would want to link their Plummer with such dogs? Who are the allegedly skilled breeders, breeding to the Standard, who are producing these dogs with such unsatisfactory movement? Are they judges as well? The Border Terrier is expected to have movement sound enough to accompany mounted huntsmen. The Dandie Dinmont Terrier is expected to have a fluent, free and easy stride. For these two breeds of sporting terrier to have even disappointing movement is a poor commentary on contemporary show ring breeders. Why join them! If you accept that movement is a manifestation of sound anatomy, why are poor movers not thrown out of the ring? When I watch the judging at working terrier shows, I still see weak pasterns, turned out toes and loose elbows up front, and cow hocks, bowed hocks, and too close or too wide a hind action. 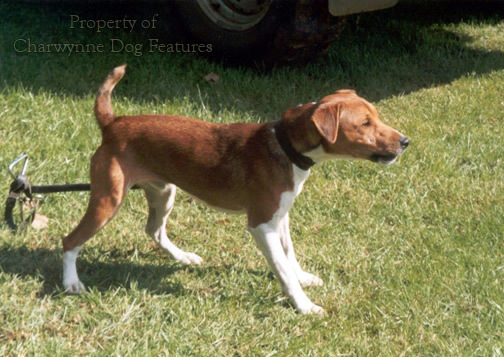 Poor shoulder placement and straight stifles and hocks are the cause of much poor movement in working terriers. Such functional dogs should move 'as square as a box', as the great terrier man OT Price would have put it. This means an action that is free, with appreciable but not long strides, parallel at both ends - showing the pads of the hind feet, with obvious drive from the hocks, a level topline - retained on the move, with the tail on top, a determined carriage of the head and a definite air of bossiness. What I find especially baffling at dog shows is how dogs are awarded tickets when they breach their own breed standard, whoever has approved it. If you examine the wording of the KC Breed Standard of the smaller terriers on movement you find highly commendable wording. The Cairn is expected to have "Very free-flowing stride. Forelegs reaching well forward." The Dandie Dinmont is required to have "a fluent free and easy stride, reaching forward at the front" with a stilted gait highly undesirable. The Glen of Imaal has to be free in action. The Scottie has to have a smooth and free movement. The Skye's whole movement is termed free and active. The Westie's must be free with the front legs freely extended forward from the shoulder. So far, so good. Sound advice from the Breed Standard. If you then spend time studying these breeds in the ring, what do you find? I see them, almost invariably, with short upper arms and upright shoulders which limit their reach and give them a fast, chopping, stilted, abbreviated front action with nothing free about it. And they win! And they win at Crufts! The extent of a dog's front stride is controlled by the length of its upper arm and the angulation or slope of its shoulders. The too-fast, short-reaching, chopping action of so many terriers in the ring has almost become the norm. A good judge would notice that there is nothing free about such an action; (owners of Plummers take note!) Not surprisingly this affects hind action too. Canine locomotion has to be coordinated! The late Tom Horner, the best terrier judge of his generation, has written on this subject: "If the upper arm is short and/or steep, the angle between it and the shoulder blade will be much greater - more open than the desired 90 degrees - with the result that the elbow will be brought forward on the chest and the possible length of stride of the foreleg will be reduced. If shoulders are also steep the angle will be greater still and the stride even shorter." Small terriers with a shortened front stride are now almost the uniform exhibit in our show rings. It is extremely tiresome when this draws admiration from ill-informed TV commentators at Crufts, who often describe them as "simply flowing over the ground", perhaps because they can't walk naturally! When a dog's shoulders are too upright they tend also to be narrower, shorter and bunch the muscles, giving a coarse look. This in turn shortens the neck and artificially lengthens the back, producing an unbalanced dog. Breeds like the Skye and the Dandie are now longer in the back and shorter in the leg than their ancestors. 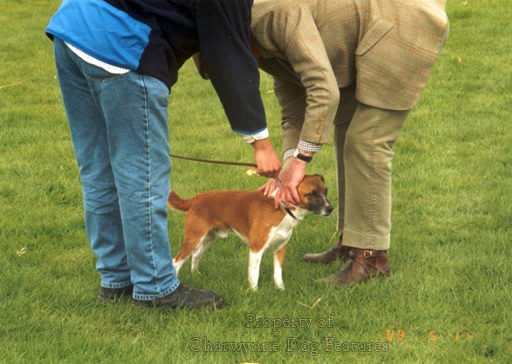 Working hunt terriers are usually a little longer-backed than their show ring opposite numbers but for a good reason, the long, sloping shoulder tending to accompany the slightly longer back, with the pursuit of a cobby terrier, with the shorter back, encouraging the more upright shoulder. Dogs required to work underground need flexible backs so that they can work in confined spaces. Most of the show Fox Terriers would have some difficulty manoevring underground because of the construction now apparently sought in them. Old-timer OT Price favoured an eel-like terrier. In his book About the Border Terrier, Walter Gardner has written: "The well-laid on shoulder allows for great range and liberty of movement. On the other hand, when the shoulder blade is lacking in correct obliquity and is too upright, it usually lacks the desired length and therefore muscle attachment. The movement is therefore contracted, and the action short, cramped and lacking in elasticity." It is this short, cramped, restricted forward movement which so many small breeds demonstrate in the ring - and get rewarded for! Walter Gardner goes on to state: "...it is unfortunate that many of those who are judging dogs have never had the opportunity to judge any other type of stock." Certainly, working horses are often stocky in build but display superbly placed shoulders. This feature is prized in the horse show ring. So many of the founder-judges at early dog shows were pony judges too. We may not want our small terriers to move like ponies but we should try to ensure that they are able to lead active lives. A tiny Norwich, a sturdy Scottie, a cocky Cairn or a perky Plummer should, each in their own way, move soundly. It is not in the best interests of such dogs for them to be allowed to get away with poor movement or be judged as if sound movement didn't matter at all. Long standing faults in Dachshunds have been short necks, upright shoulders and loose elbows. Not surprisingly movement in the breed has long been a weak spot. The high head carriage helps this breed, but it has to take an awful lot of steps to get anywhere. Unless the head is carried high, the appropriate muscles will not be able to pull the upper arm and then the whole foreleg forward to its full extent. Judges need to watch a dog moving across and then towards them and establish that the two forelegs are being brought well forward from the shoulders and the elbows. Any dog that 'marks time' is incorrectly constructed. Insufficient angulation between the pelvis and the spine, high placed hocks and straight stifles contribute to a short back stride and can be detected from a stilted action. But if that stilted action is actually admired, the fault is surely condoned. A canny judge will ask for small dogs to be moved slowly so that the true quality of the gait can be revealed. Just as the flying trot conceals a multitude of sins in the German Shepherd Dog, so too does the blurred, too-hasty, millipede-like, leg movement in smaller dogs with shorter legs. Smaller dogs with smaller bones, just as much as bigger heavier dogs, need sound construction to lead a healthy happy life. 'Stepping short' on the parade ground is a deliberately artificial movement and a surprisingly tiring one; stepping short in the show ring too should be regarded as artificial, unnatural and undesired. All dogs can only move with the construction bestowed upon them by their designers and breeders. But I suspect, with some sadness, that breeders will continue to do their own thing whatever the effect on the dog, whatever the loss of essential stamina. 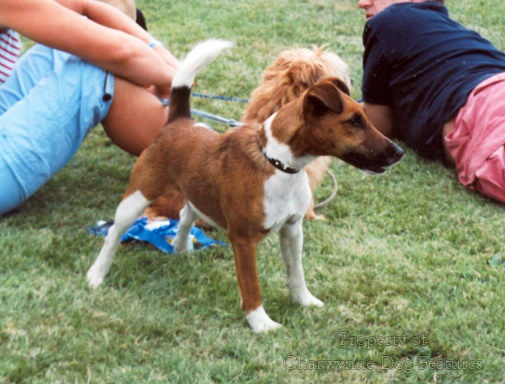 In a still-emerging breed, like the Plummer Terrier, breeders have a one-shot opportunity to breed working terriers which could be envied the world over; others are departing from soundness, now is the time to breed for the breed and not the wallet, establish the basis of a breed which respects its own breed standard but ensure that dogs lacking working instincts are not bred from. Any fool can breed charming little dogs, which resemble tail-less squirrels or white-coated Yorkies fit only for the bed-warming role. Breeding a working terrier is surely a joyful challenge: does it want to work? does it have the anatomy which allows it to work? Will those who come after us respect our work? Plummer Terrier breeders of today bear a heavy responsibility. We live in increasingly urban times which threaten the very future of our sporting breeds. This means that without a loyal, well-intentioned, selfless, honourable band of breed fanciers to safeguard its future, many a breed will go to the wall. Sporting terriers will only survive when their survival is planned - and their ability to work underground, to move effortlessly, based on sound construction, to perform their role and their true terrier type is ensured. I want the Plummer to be deservedly called a sporting terrier and to survive!